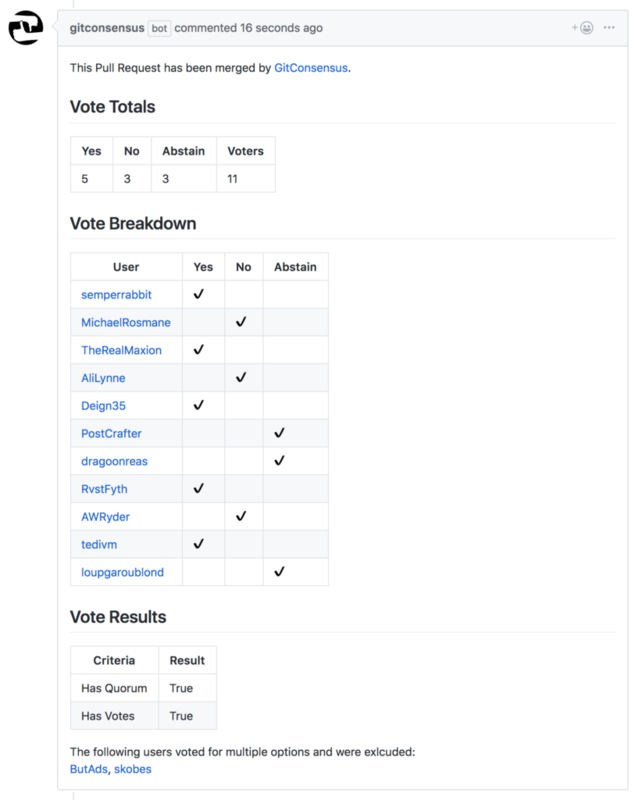 Last year I introduced a way to manage open source projects with GitConsensus, an open source Github bot that anyone can download and run. Today running GitConsensus is even easier with the availability of a new GitConsensus GitHub App. Developers can now add GitConsensus directly to their repositories simply by enabling it in GitHub and then adding the consensus files. There’s even example consensus rules covering a variety of options, from anarchy to oligarchy (with a set of recommended rules that is good for most projects). In order to get this all working I also had to build a new GitHub Apps Python Library. This library extends the excellent github3.py library, making it easier to extend projects already built using it into full-fledged GitHub Apps. Release v0.14.1 is a major update to Stash, and quite likely the last line of releases before v1.0.0. The biggest addition is support for PSR-6. Stash now implements the various interfaces natively, allowing it to be directly injected into PSR-6 compliant libraries. This did require a few API changes (which prompted some cleanup of deprecated functions), so please make sure to review the release notes. Stash remains one of the best tested caching libraries out there, and this improved on that significantly. In addition there have been optimizations and improvements in PHP7 support, including behind the scenes switching between the APC and APCu functions. The Symfony Stash Bundle has also been updated, with version v0.6.1 utilizing the Stash v0.14 line. Dropped support for PHP 5.3. Removed various PHP warnings (exceptions are still thrown where needed). Various optimizations, such as reduced function calls during repeated operations. Added “isPersistent” method to driver classes. Added ‘logger’ config parameter to caches so that they may be injected when each cache is created. Compatibility updates for our upstream projects. One of my favorite backup tools has always been rsnapshot. It’s based off of rsync and uses a nice trick with hardlinks to maintain incremental updates that are also full updates. It runs using a basic configuration and a series of cron jobs. This is unix as it’s meant to be- extremely light weight while also being very powerful. I am rather picky with how it is set up though. I don’t like leaving root open over ssh, which means a sudo based solution is needed on the client side. I’m also rather paranoid, which means I like my backup solutions to be read only. I also don’t like all of my machines running off of a single rsnapshot configuration, as this means a failure for the script to run on one means it won’t run on the ones after. For years I had a set of scripts to handle this, but in the days of configuration management that seems almost silly. To make life easier I’ve put this all in a Puppet module. The amount and value of data stored on Github Enterprise servers is quite large, and backing them up is rather important. To keep people from doing desperate restores from cloned repositories Github has a tool for backing up and restoring GHE installs. To make this even easier I’ve put together a Puppet module that takes care of the basic setup and configuration of the GHE backups tool. In fact if your network will resolve “github” on your search domains you can even skip the ghe_hostname parameter. Storing backups with a custom location and number of snapshots is not much more difficult. This module also keeps the backup utility up to date and takes care of some other minor issues around installing this package. For full documentation view the module on Puppet Forge, and as always contributions are always welcome on Github. Today I’m announcing the release of Hieratic, a new Puppet module designed to improve the integration between Puppet and Hiera. Hiera tries to improve Puppet by taking site specific data out of manifests. Hiera makes it possible (and even easy) to define complex sites by making general configurations and then defining only the differences between each node. This can be done on a very granular (and configurable) level. If you haven’t played with Hiera yet take a minute to read through it’s overview and bask in the awesome. As much as I love it though Hiera is not without flaws. Since it wasn’t shipped by default in Puppet until 3.0 many modules do not have built in support for it. Automatic Parameter Lookup partially solves this problem, but has some serious limitations that significantly reduces it’s usefulness- the biggest being that it is incapable of merging values from multiple levels and only provides the highest priority items. Hieratic solves this problem. It lets you define a variety of a resources, including classes, while still allowing deep merging to occur. With Hieratic it’s possible to completely separate Puppet code from configuration. This update has a lot of bug fixes and optimizations, particularly around character encoding, that have been submitted by over a dozen contributors. This release also contains two new functions- listMailboxes and getOrderedMessages. The PSAD Puppet Module has been updated. The major addition includes some better handling of the PSAD service checks, which should result in a faster check of the PSAD service and remove some potential warnings on versions of Ubuntu. Additionally some documentation and formatting updates have been made. Special thanks to netson for their contributions! This backwards compatible release contains a number of feature and stability improvements. On the HHVM front a nasty regression with APCIterator was resolved, continuing the commitment to HHVM compatibility. The Filesystem driver was given an alternative format, JSON, for systems where the native PHP was not optimal. This driver also saw signicant performance improvements related to the clearing functions. The Redis driver was given additional tests, improved error handling, and better support for persistent connections. Memcached also received improvements around it’s use of persistent connections, as well as support for the AWS autodiscovery feature. In addition to those points there were a few minor bug fixes as well as some readability related code improvements. Special Thanks to Steve Clay, Paul Scott, Matthias Kreft, Ben Clark and Giuseppe Roberti for their contributions to this release! Stash reaches 100k Downloads through Packagist! Stash is following the milestone JShrink hit last week and has reached it’s 100,000th download using Composer and the Packagist repository!